On February 28, 2013, Shaheed Ali Mustafa was martyred by gunfire of police, BGB and Awami Chhatra League, when he was among protesters who were protesting against the court verdict of Allama Delwar Hossain Sayedee. He was martyred by a bullet right between his eyes, which led to his immediate death on the Circuit House corner. 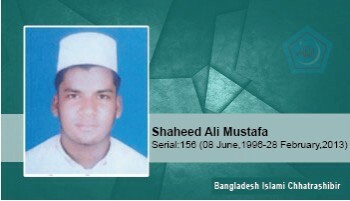 Shaheed Ali Mustafa was a Shibir associate, and a 2nd year Alim student of Khanpur Alim Madrassah.